A program to a dinner dance in honor of John Glenn's (1921-) orbital flight on Friendship 7 (MA-6), which occurred on February 20, 1962. The dinner, was sponsored by the Launch Team (which was generally composed of National Aeronautics and Space Administration, General Dynamics, the McDonnell Aircraft Corporation, and other contractor personnel) on April 23, 1962, at the Cocoa Armory, located at 308 North Fiske Boulevard in Cocoa, Florida. Signators include Freedom 7 astronaut Alan Shepard (1923-1998), the first American in space; Luge Luetjen; Manager for McDonnell Aircraft, Paul C. Donnelly (1923-2014), NASA Engineer, Manager, Spacecraft Test Conductor for Project Mercury; Glenn, the first American to orbit the Earth; Aurora 7 astronaut Scott Carpenter (1925-2013), the second American to orbit the Earth; Mercury 7 astronaut Deke Slayton (1924-1993); Sigma 7 astronaut Wally Schirra (1923-2007), the hird American to orbit Earth ; B. G. MacNabb, the Site Manager for General Dynamics Astronautics; Annie Glenn (1920-), Glenn's wife; Faith 7 astronaut Gordon Cooper (1927-2004), the fourth American to orbit Earth; , T. J. O'Malley (1915-2009), Manager for Cape Canaveral Air Force Station (CCAFS)'s Launch Complex 14 (LC-14) and Launch Conductor for General Dynamics Astronautics. Original 4-page program, 1962: Private Collection of Dr. Calvin D. Fowler. Digital reproduction of original 4-page program, 1962. "The Friendship 7 Mission: A Major Achievement and a Sign of More to Come." National Aeronautics and Space Administration. http://history.nasa.gov/friendship7/. 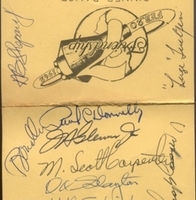 Al Shepard; Alan Bartlett Shepard, Jr.; Anna Margaret Castor Glenn; Annie Castor Glenn; Astronaut Group 1; B. G. McNabb; Cal Fowler; Calvin D. Fowler; Cocoa; Cocoa Armory; Deke Slayton; Donald Kent Slayton; Friendship 7; General Dynamics Astronautics; Gordo Cooper; John Herschel Glenn, Jr.; Leroy Gordon Cooper, Jr.; Luge Luetjen; MA-6; Malcolm Scott Carpenter; McDonnell Aircraft Corporation; Mercury 7; Mercury Seven; Mercury-Atlas; Mercury-Atlas 6; NASA; National Aeronautics and Space Administration; Original Seven; Paul Charles Donnelly; Project Mercury; space; spacecraft; T. J. O'Malley; Thomas Joseph O'Malley; Wally Schirra; Walter Marty Schirra, Jr.
“Dinner Dance in Honor of John Herschel Glenn, Jr. and Friendship 7 Program.” RICHES of Central Florida accessed April 24, 2019, https://richesmi.cah.ucf.edu/omeka/items/show/6398.